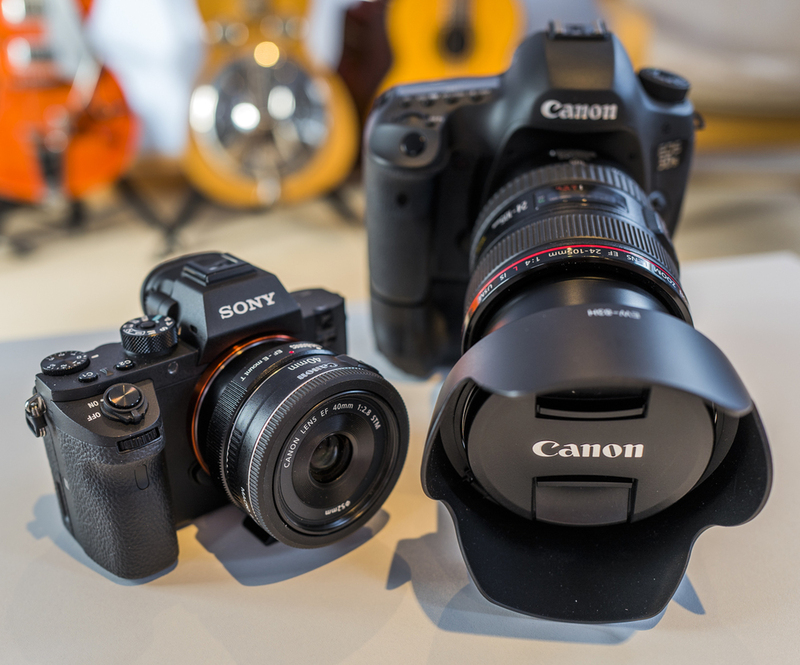 The Canon 5Ds (with and without 'anti AA filter filter) and the Sony A7r II are currently the highest resolution non-MF cameras available to photographers. Since I own and use both, I thought I would relate my experiences of using both, in terms of how they work for shooting stock. Even though most stock pictures are used at small sizes and a high % are used on the web, there are still advantages in producing large high resolution files. Firstly it takes care of the rare, but still possible, need for very large reproduction. Secondly, the file can be cropped and still produce a useable image and thirdly the 'psychological factor' that large files are perceived as being of very high quality. And since for a lot of libraries there isn't any difference in price between small and large sizes, why not buy the larger file? Plus there is the fact that we can't anticipate the future. There may well be a need for large, high-res files, that isn't currently anticipated, so the 120MB and 144MB files that these cameras produce should be able to deal with those requirements. So, what are the advantages and disadvantages of each camera? Before I start, I'll make one thing clear. I won't be coming down in favour of either camera. I use both and will continue to do so for the foreseeable future. And rather than regard them as different I do actually see them as somewhat similar. This obviously has a lot to do with the fact that I use my Canon lenses on the A7r II, via a Metabones "Smart" adapter. And while the Sony is a mirrorless camera and the Canon is a DSLR, for the majority of my outdoor work I don't have any particular preference. In fact I see them as backups to each other, even though they are seemingly very different. Let's get this size thing out of the way first. 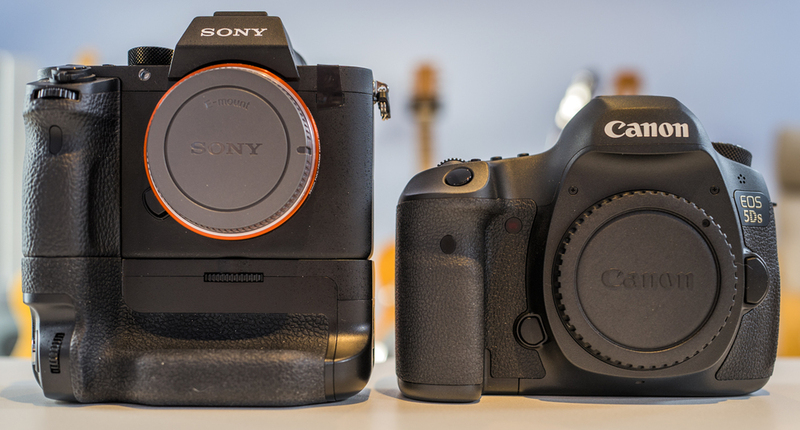 Yes the A7r II body is lighter and smaller, though this doesn't extend to some of the lenses. 'Full-Frame' is 'Full-Frame' and the lenses reflect that. 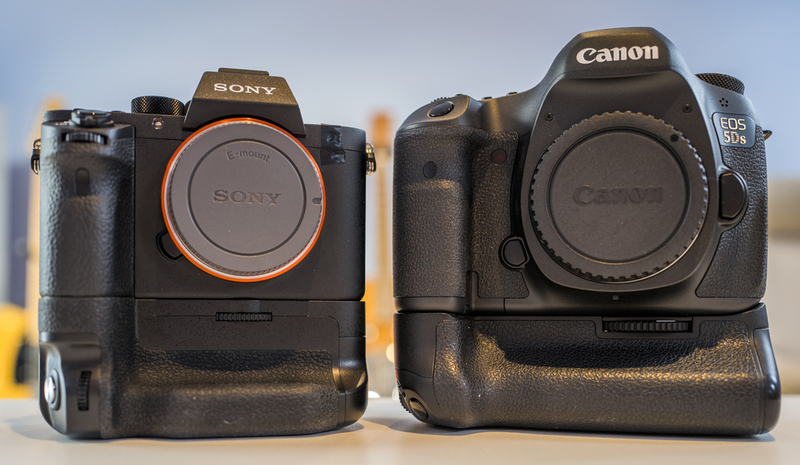 In fact some of the Sony zooms are heavier than their DSLR equivalents. Since I use Canon lenses for both cameras, that isn't an issue for me, though the Metabones adapter does add some weight. But there is an issue that few pick up on. I can take out my 5Ds body, no battery grip, with a fully charged battery and know that I have enough power for a days shooting. For stills I've got enough juice for well over 1000 images and that's more than enough. Even if I combine some HD video footage I'm still covered. However with the A7r II, I need at least 4 batteries, particularly if I'm shooting 4K video. And if I was on a video only shoot, I would be taking 6 batteries with me. And those 6 batteries give me about the same power as one battery for the Canon. Most of this is explained by the constantly running live view and EVF, but even so it makes a real difference to what I have to carry around with me, including the battery grip. So for me, it's pretty much even on that. However for video, things are somewhat different. As regular readers will know, most of my video is hand-held. The kind of work I do, involving lots of walking, means that carrying a tripod and a big rig is not something I could do. So it's here that the Sony really scores. Because the Canon doesn't have an EVF, to monitor the video I have to attach my Carry Speed Loupe. 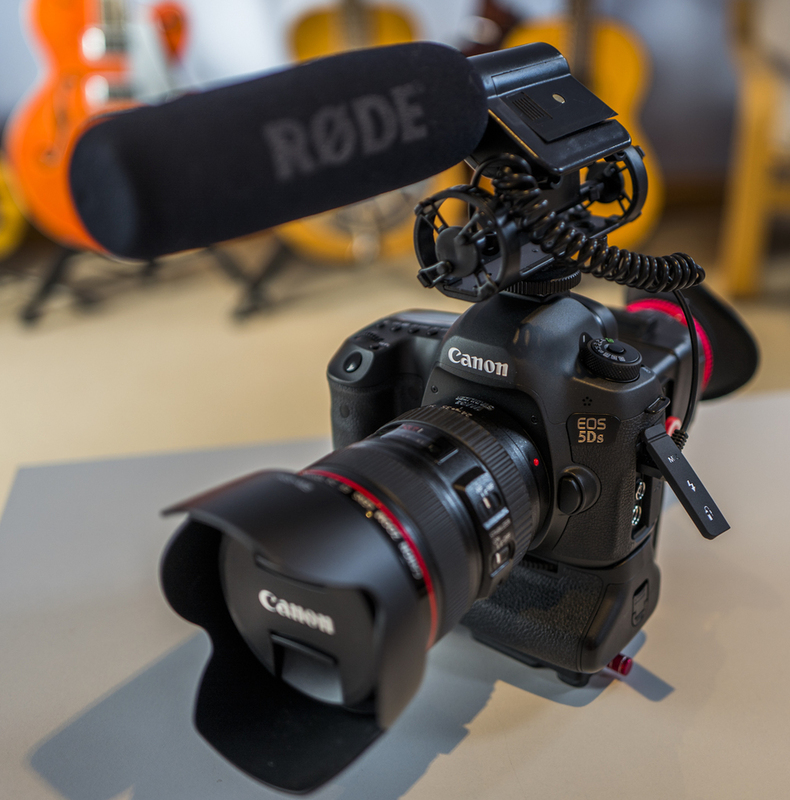 Now I don't use the outfit which I photographed above with Rode microphone, battery grip and loupe, but the 5Ds for video is somewhat of a struggle to use, even though I can use my 24mm f/2.8 IS prime. And even though the HD 1080 output from the Canon is absolutely superb, the 4K that the Sony offers is much more 'commercial' when I'm selling video clips. So in terms of that, definitely an advantage for the Sony and one of the main reasons I bought it. For me, the Canon is easier to handle. The larger body means that there is more room around the controls. 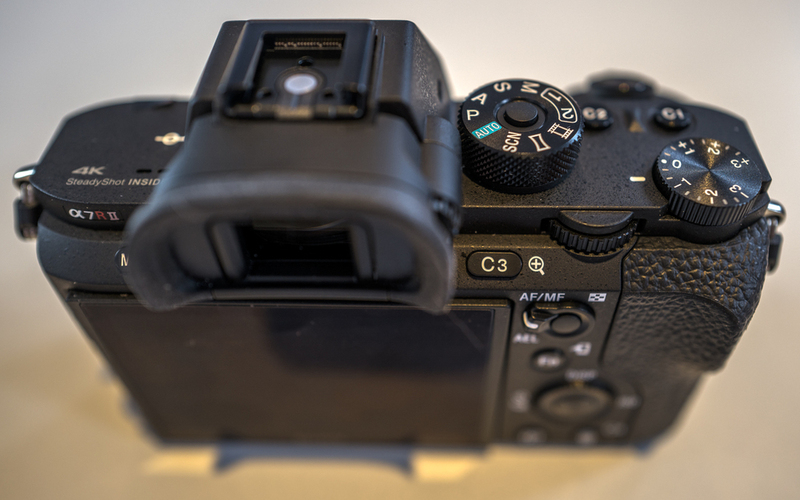 The A7r II is a typical mirrorless camera with lots of controls, knobs and buttons in a small space. And I have to say I've never understood why mirrorless designers don't do what Nikon and Canon do, which is spread their controls on both sides of the camera. For reasons best known to themselves, Sony stick everything on the right hand side, making it very 'lop sided' to use. However it's not that much of an issue. I also like the Canon for menus and quick access. The Sony layout seems somewhat illogical to me. And while the Canon certainly has some fiddly controls, overall it seems more user friendly to me, but thats a personal choice. I firmly believe that lens stabilisation is more effective than IBIS. And Panasonic agree with me!! The lens IS on my Canon is the best I've ever used for video and since my Metabones adapter triggers that on the Sony that's what I use on that camera as well. Over the years I've used both systems and time and time again I get better results with lens IS. Not that I rely on it, apart from video (where I add in software stabilisation anyway) And it's interesting that when Olympus releases the 300mm f/4 they added lens IS. I know some people have strong views on this, but I will stick with the way I've always preferred and certainly for A7r II video, my Canon lenses are much more useful for me when I'm hand holding than anything Sony produce. And despite how many axis's Sony come up with, I will remain unconvinced. And if anybody cares to show me anything shot with IBIS only that beats this hand held footage shot with lens IS only on my Canon 5Ds, I'd be VERY interested to see it!! As the title (Introduction) implies there are going to be more posts on this. And despite my antipathy for posts with tests and comparison shots, I will force myself to do one for these two cameras. However, these are my impressions so far. The Canon has more pixels. Now some will tell you that doesn't matter particularly. But I would point out that the Canon's 7.5MP advantage almost equates to an A4 (Magazine Cover Size) file. So, not nothing. However, this tells you just how big the files from each of these cameras are. Now I often publish diagrams like this, because it's useful to see the file sizes modern digital cameras deliver. When you consider that 35mm film was reckoned to be the equivalent of 10MP, you can see how far things have come. For instance some people write about how 16MP is getting somewhat 'old hat' but as you can see it's only very marginally short of A3 size. And as someone who still scans film, I would never push a medium format film scan higher than 24MP. But now the Canon 5Ds and Sony A7r II are delivering resolution and file size around twice that. Truly astonishing and something I would never have expected from my early digital days working with 2,4,5 & 6MP cameras. Now I'm also not going into any discussion of AA filters, because these days it's a waste of time. Manufacturers push the no AA filter angle because it sounds good, but these days those companies who advertise that do the same thing with software \ firmware anyway. I suspect even Leica are doing that. So sharpness is sharpness and has to be assessed on what comes out of the camera. And since even raw files have all sorts of in camera 'corrections' done to them before we even see them, it's important to assess files on what emerges. What emerges from these two cameras is very similar. The Sony A7r II produces files with slightly more acutance and slightly less luminance noise. But it's a very close run thing and can depend on the lens used and how I process the raw files. In real terms both cameras create images that will stand very close scrutiny and facilitate large scale reproduction for the most demanding of uses. Because of that I saw no reason to buy the more expensive 5Ds R. No one except the most blinkered prejudiced fanboy would say that either camera is significantly better than the other in terms of producing amazingly detailed high resolution files. And all the other boxes are ticked as well. Excellent dynamic range and with the right lenses and the correct profile applied - clean sharp images. And surprisingly, even with this very high pixel density, both turn out pretty good high(er) ISO results as well. Particularly when you bear in mind that for the vast majority of publishing purposes, the files from these cameras are going to be significantly reduced. So are these cameras useful for Stock? Well is the Pope a Catholic? These two cameras, when you take into consideration image size, usability and value for money are the best there is. Medium Format has bigger sensors and more pixels, but very limited functionality and ridiculous prices. (Because of the few people who buy them rather than any great quality difference) And I really can't think of any publishing purpose for which both the Canon 5Ds and the Sony A7r II aren't capable of handling. I'm glad I can afford to use both, as both will contribute to my stock portfolio. Sure there are some differences which I'll go into in further posts. But if you like Mirrorless as a concept or still trust DSLR's then neither will provide anything other than great results. 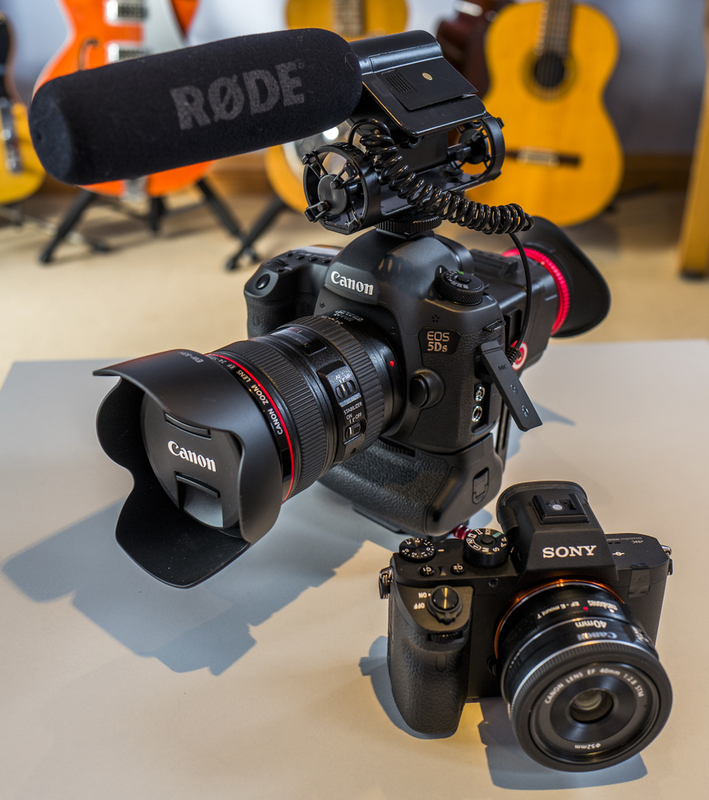 If 4K is to your taste then the Sony is the one, but don't forget that 1080 HD is still the industry standard for video and the output from the 5Ds is simply stunning and in many cases a lot better than some of the dodgy 4K some cameras turn out. Two great cameras.